YouTube has opened a separate section dedicated to K-pop for the first time, Google, which owns the video-sharing website, said on its official blog on Wednesday. YouTube divides music into pop, rock, R&B, rap and other genres. But this is the first time it has created a separate genre for a particular country's music. Eric Schmidt, Google's executive chairman, met with President Lee Myung-bak at Cheong Wa Dae in Seoul last month and said YouTube was pursuing several avenues to help spread Korean cultural content, including a dedicated K-pop channel. With the creation of the new channel, K-pop has become more accessible to foreign fans. Over 5 million videos by K-pop groups have already been uploaded on the site, including 400,000 featuring boy band TVXQ, 340,000 of all-girl dance group Girls' Generation and 260,000 by the Wonder Girls. But the difference is that most of these videos were posted by the bands' respective management companies. This means that fans had to search for each artist or song separately, limiting their exposure to other bands. 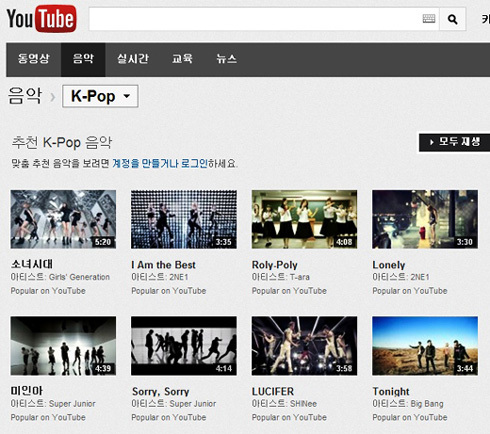 The new K-pop channel addresses this problem by grouping videos together. Google said on its blog that the K-pop videos available on YouTube are popular not only among fans in Korea, but also in other countries like the U.S., Canada and Latin America. It added that the new channel will serve as a window to spread Korean culture around the world through music.